Try to find a coffee with the acid reduced through a process much like the ethyl acetate solvent decaffeination process. These coffees, treated in Germany, are marketed under the name special mild coffees. They are hard to find, do not offer much choice, and suffer from the same potential for flavor-diminution as decaffeinated beans. Buy a moderately-dark- to dark-roasted coffee. Dark roasting reduces the acid sensation in coffee. 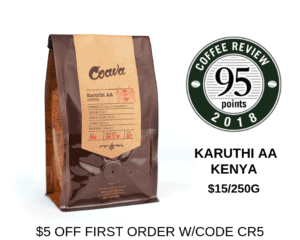 It also helps to buy very good coffee, because the best coffee has been processed from ripe coffee fruit, and coffee from ripe fruit is naturally sweet and lacks the sharp, astringent sensation of cheaper coffee processed from less-than-ripe fruit.